Early Connections was honored to receive the 2014 Bracken Award for Excellence in Nonprofit Governance as exemplified by our Board. The Nonprofit Partnership presents this award annually to a nonprofit organization that has demonstrated a sustained commitment to excellence in governance. 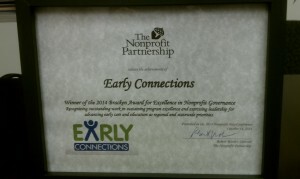 This award reflects the ongoing stewardship, dedication, and support by our Board of Directors for the work of Early Connections. This entry was posted in highlights by [email protected]. Bookmark the permalink.